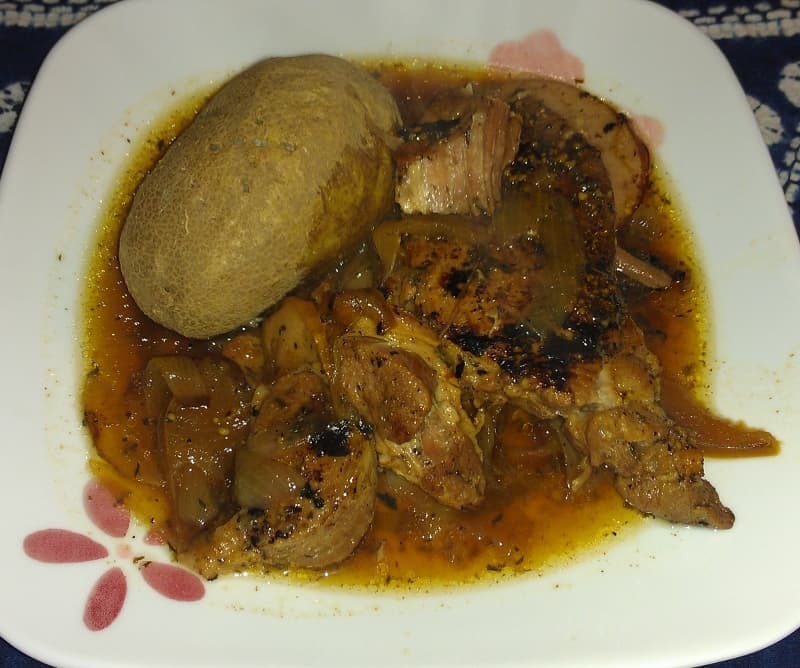 In December I tried Alton Brown’s Pepper Pork Chops in the slow cooker. I liked them (a fair amount, in fact) but never got around to writing about them, unfortunately. Now that it’s January and I feel lacking in inspiration, I thought I would give them another try. After all, if I make a recipe I like, I really should blog about it, shouldn’t I? For brine, combine broth, sugar, salt, and black pepper in small saucepan. Heat and stir occasionally until sugar and salt dissolve. Cool for a while (or don’t), add ice, and pour into zipper bag with pork chops. Brine pork chops overnight. The next day, rinse and dry pork chops. Cook with a little olive oil in skillet over medium/medium-high heat for 3 minutes per side. Place in crockpot. Saute onions in skillet for 3-4 minutes, until they start to brown. Add chicken broth to deglaze. Pour onions and broth over pork chops. Add sliced apple, black pepper, and thyme. Cook on high for 90 minutes, then turn to low and cook for another 4 or so hours. Serve with broth with something that will sop up the flavors – like bread, rice, or potatoes. This was really tasty. The broth was sweet, salty, and peppery. The pork was very tender and fell from the bone. The pork was not dry (although I must add the caveat that I ate it swimming in broth). A part of me thinks there ought to be an easier way to make this. Do I have to brine the pork? Do I have to sear the pork chops and onions first? I may experiment. In any case, if you love black pepper like I do, this is definitely a dish for you.